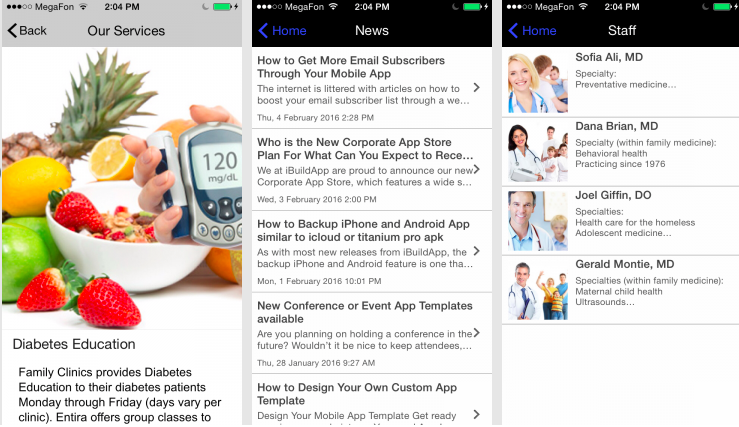 iBuildApp built apps that became the leading medical resources for clinical use by primary care physicians, nurse practitioners, medical students, and other health professionals. In the digital and mobile age, you have a unique chance to connect, as a general practitioners or primary care family physician with your patients, without putting in much work at all. Simply start an app using one of the prebuilt mobile solutions for general practitioners and primary care family physicians, and you can start connecting with people no matter where they are. Let’s take a look at some ways to market your general practitioners and immediate care physicians’ office by using a simple mobile app. When you’re a primary care physician for family or women, you have to rely on split-second decisions. Though your medical articles may help you out in emergency, you can’t always get advice when you need it. Find almost any disease, condition and procedure by checking over 100 articles authored by general practitioners and primary care physicians for family and women, videos tutorials, and and protocols. 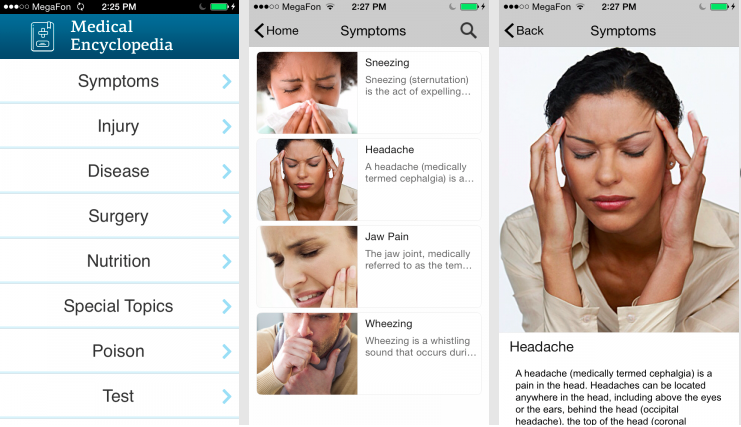 Medical Directory pre-built app provides general practitioners with instant access to drug, disease, and diagnostic data . Primary care physicians can make a search by selecting symptoms and viewing a list of potential conditions and problems. Doctors can get access to the information on Drugs and Supplements, as well as see Uses, Side Effects and Warnings by typing the disease name as well as by code. The appointment page is a crucial way for doctors to make it easier for patients to schedule appointments and even cancel without having to call the office and speak to a person. This not only cuts down on the time you and your employees spend chatting on the phone, but it offers patients a way to connect with you quickly. 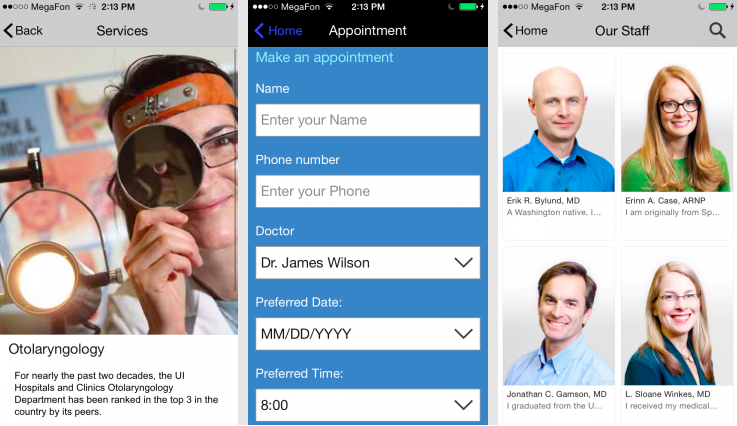 Use your practice mobile app to schedule and edit appointments, look up client contact information, and create, edit, or review notes on the go. Appointment confirmation notifications: Patients will receive a reminder reminder to confirm or cancel an appointment. SMS and Email reminders: Get less no-shows or cancellations with instant SMS and email messages. General practitioners and primary care physicians realize that not every person who strolls through their office booked a time three weeks in advance. Sometimes a patient has an emergency so they must go to your office while driving home from work or while walking nearby. 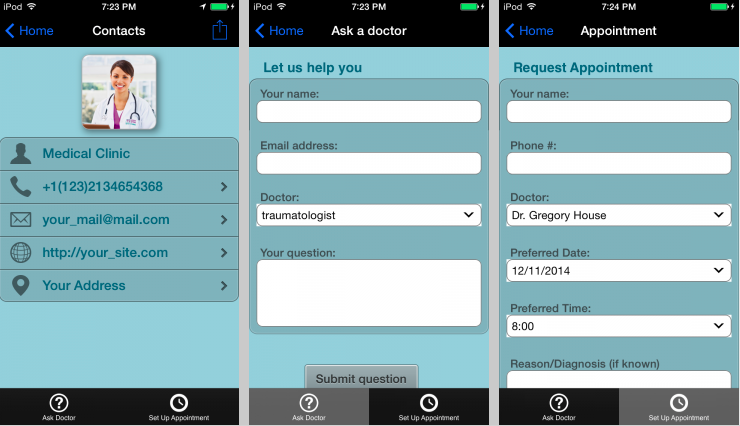 The only way to grab these last-minute patients is to offer a mobile app that features a map to look for directions. Patients bring up the location, search for directions and they are well on their way to your office without you thinking about the whole process of explaining directions on the phone. Stay current with the latest medical news and updates. 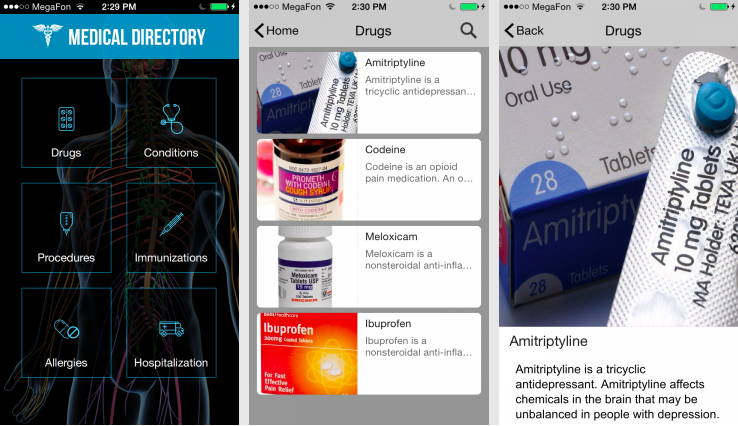 Find useful resources within the medical app such as: Step-by-Step Procedural Notes, Medical Calculators, Formulary Information, or a recent medical study on a particular drug. Patients choose from hundreds of doctors, so a way to differentiate your practice is by linking to nice videos and tutorials so people can stay healthy without even talking to you. Since you have videos or other forms of media, people are more likely to book with you instead of a comparable doctor with no free content. People make decisions based on recommendations, so think about adding a testimonials page or a tab that directs to a list of video testimonials. These testimonials are the ultimate way to sell your doctor’s practice. Share your thoughts on our article in the comments section below. Let us know if you need more ways to market your general practitioners and primary care family physicians office, and explain what techniques you have used to find more clients who could use your services.